A while ago, I built my first Dutch Tool Chest. I have been working out of that chest ever since. That may sound impressive, but two successive shoulder surgeries have REALLY curtailed my productivity over the past two years. The rails to the left and right are battens. 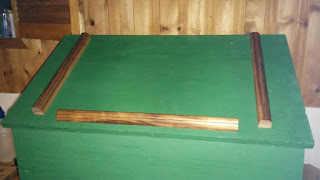 I was going to put the battens in the usual place on the bottom, but at the very edge of the lid so they would act as a dust shield of sorts. Unfortunately, I didn't leave enough room for comfort for the battens to do their job. Putting the battens further inboard on the bottom would also impinge on my plan for that tool space. So, I figured to dress them up and put them on top. While working on the more eye friendly battens, an idea occurred to me to use the rest of the space for more than decoration. Above you see the fruition of my idea. I placed a ledge on the lid to hold books, papers, or my tablet. I will put one on my second tool chest as well, I believe. 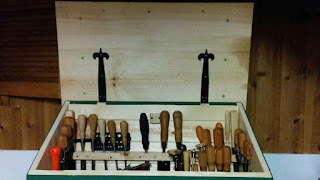 I think the next big tool storage project will a Schwarz style Anarchist Tool Chest, but I'm in no hurry to build it. 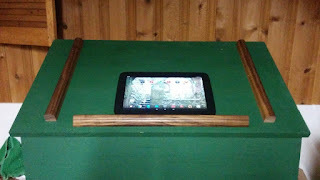 That's a neat idea, both for turning the otherwise "useless" slanted fronted of the dutch man into something functional, and also finding a safe & clear space for phone/tablet that for me tends to end up dangerously close to the edges of my bench. you could also ues this for pencils/knives/squares/bevels when mid-project. You followed my thought train exactly! Since I have two of these chests, I have a feeling one of them will be my draftsmen table. The chest above is my primary box with all the basic tools. The second chest is the tool attic, where all the other stuff goes to live until needed.